So, you know how yesterday we were certain that Big Dog morphed into Rip Chords? After finding this LP, we're really not sure. 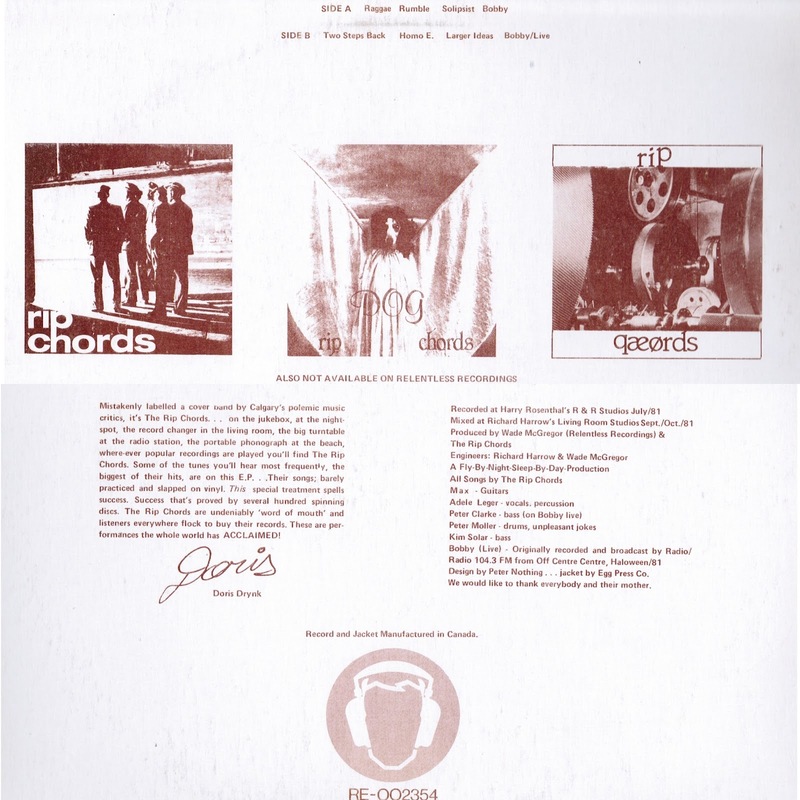 This looks like it's the mythical third Rip Chords LP, but it's actually more like the first, with a date of 1981. Which puts it before the Big Dog cassette. This is why sometimes we wish we would actually do some research instead of fabricating these stories. Mistakenly labelled a cover band by Calgary's polemic music critics, it's The Rip Chords... on the jukebox, at the nightspot, the record changer in the living room, the big turntable at the radio station, the portable phonograph at the beach, where-ever popular recordings are played you'll find The Rip Chords. Some of the tunes you'll hear most frequently, the biggest of their hits, are on this E.P... Their songs, barely practiced and slapped on vinyl. This special treatment spells success. Success that's proved by several hundred spinning discs. 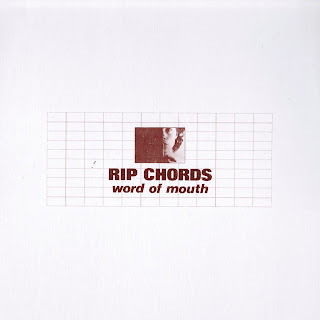 The Rip Chords are undeniably 'word of mouth' and listeners everywhere flock to buy their records. These are performances the whole world has ACCLAIMED! The only way we can read that is with tongue firmly in cheek. There was no relationship between the mighty Rip Chords and the snarly Big Dog, except for Peter who played with both bands. There was a split LP issued, but that was pure economy, with no creative collaboration between them. We all knew each other to some extent. There is no 'm' on the end of my name, should be 'n' - but I think that was an in-joke at the time some of us knew. Fuckers. Great times. That is all. 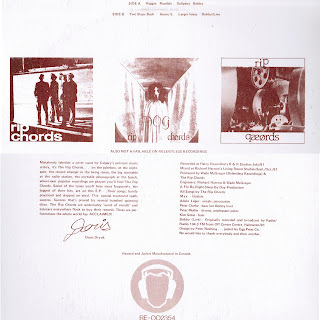 One of our albums(vinyl)was a collaboration with the late Paul Woodrow, and Brian Dyson. 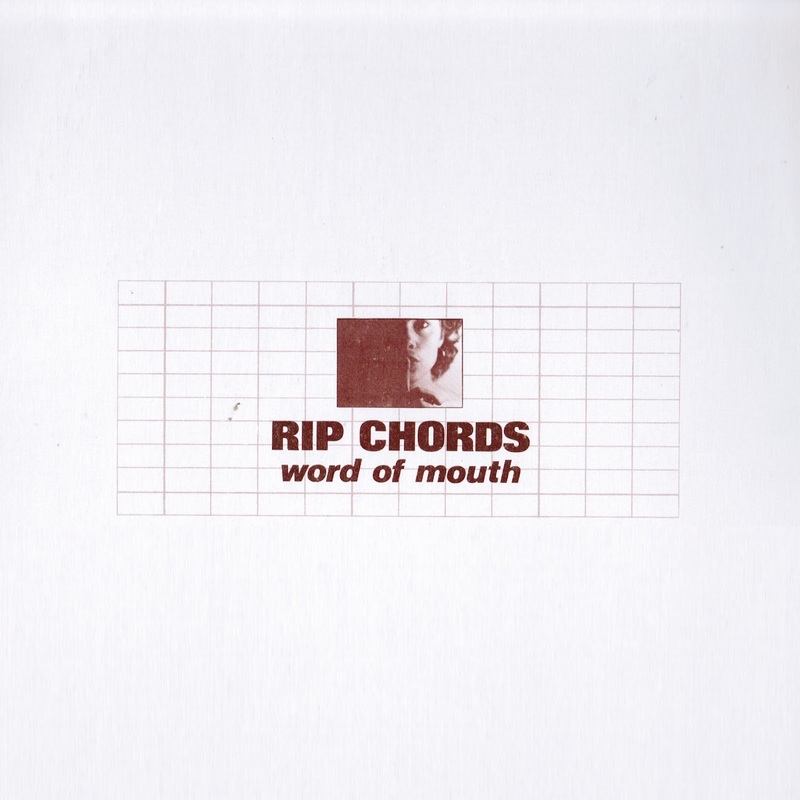 One side of the album was Rip Chords, the other was called Big Dog. The Rip Chords backed up Paul and Brian on all of their songs' recordings for that album. Still, I'm not certain if there was a different Big Dog altogether...?